The Periotest is the instrument most commonly used for measuring osseointegration in dental implants. 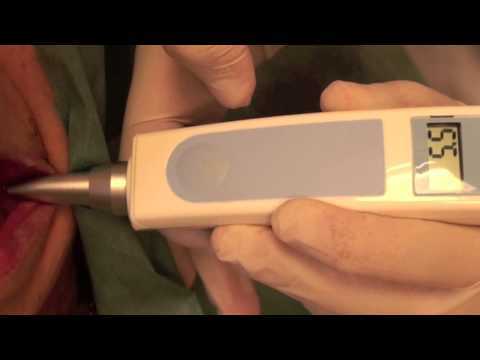 It is also available as a hand-held mobile device, known as the Periotest M. Now it is even simpler to perform an objective evaluation of an implant’s stability. Thanks to its wireless design, the user can now benefit from a maximum freedom of movement. It is no longer necessary to provide a surface for apparatus in the vicinity of the patient. The device’s internal lithium-ion battery is simply recharged in the base unit provided, just like a cordless phone. What many implantologists are looking for is a simple and quick method of gaining an objective statement as to whether the implants they have made have become well osseointegrated and can be loaded. With the Periotest M, we have developed a device that is able to fulfil these requirements, and which can be seamlessly incorporated in the workflow of any dental practice. The basic concept of the Periotest M is impressive because of its simplicity: the device is activated by a single switch and the measuring sequence begins forthwith. The test results are shown on the instrument’s integral display. The new model retains the strengths of the traditional Periotest measuring procedure, particularly its suitability for use in universal applications: the instrument can be used for taking measurements on a wide variety of implants, without the need for any special accessories, such as a transmitter or similar device. The Periotest is clearly a very economical measuring instrument. Moreover, the Periotest can be employed at all stages of implantological treatment – from primary stability testing, through the healing period, and right up to the finished prosthetic. It is this ability to measure the finished crown that is of particular value. According to reports, every tenth implant is susceptible to periimplantitis 15 years at the latest following its original insertion. By conducting continuous tests with the Periotest, it is possible to detect and treat this condition at an early stage. It is therefore recommended that implants are measured routinely using the Periotest. Doing so will serve to build a sense of security and trust, both for the dentist and for the patient. Overall Zirconia implant patients experience a shorter implant process along with the potential for a significant increase in comfort and function afterward due to biocompatibility and the strength of zirconia. I believe it depends on the country you want to purchase it. Medizintechnik Gulden e. K. http://www.med-gulden.com is the manufaturer.